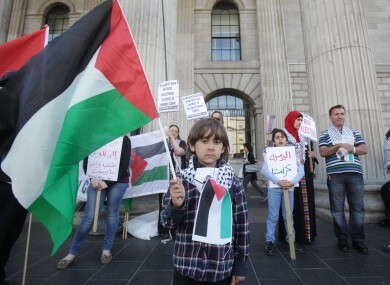 The Ireland Palestine Solidarity Campaign has made a formal complaint to the bank. THE IRELAND PALESTINE Solidarity Campaign (IPSC) has formally complained to Bank of Ireland after it shut down its bank account. It said today that it has made a formal complaint to Bank of Ireland and intends to take a case to the Financial Services Ombudsman. Since the news broke at the weekend, the IPSC has called for “political and civil society” to support its demand that Bank of Ireland reinstates its accounts closed last week. The IPSC described itself as “a Palestine rights advocacy group whose main activities are organising public meetings to raise awareness of Israeli occupation of Palestine and promoting the global boycott, divestment and sanction (BDS) campaign against the Israeli state as means of securing freedom, justice and equality for the Palestinian people”. It said that Bank of Ireland’s actions come in the wake of similar actions taken by banks against Palestinian solidarity groups in the UK, France, Germany and Austria. In June 2016, Bank of Ireland requested information from the group about its sources of funds and how funds were spent, said the IPSC. The campaign is a registered not-for-profit company limited by guarantee. It answered the questions and also sent its audited accounts, which it said shows income of €51,000 for 2015, the bulk of which is spent on office and campaigning costs. In 2016 the IPSC paid one invoice of $1,200 to the Hirbawi Keffiyeh Factory in Palestine for scarves used as solidarity items. The IPSC said that Bank of Ireland “failed to give a specific explanation of why it was closing the accounts”. Squires said the advocacy group has sent just €1,200 to Palestine in the last financial year and that was trade, not charity donations. He added: “In the last year or so we have had €1,200 go to Palestine to pay for Palestinian scarves, which is a tiny amount. That’s trade with Palestine. It’s not like we’re sending money to people there. In response to a query from TheJournal.ie, a spokesperson for Bank of Ireland said it does not comment in relation to customers’ accounts. This is not the first time that Bank of Ireland has shut down the accounts of political organisations. In the summer of 2014, BOI banned all business transactions to and from Cuba, due to a business relationship it has with a US bank. In the months after the ban came to light, it became clear that the restrictions were also being applied to personal customers – and even to customers who had nothing to do with Cuba, but who happened to have put the country’s name on bank transfers. Speaking to TheJournal.ie, the NGO’s coordinator Simon McGuinness said Bank of Ireland should “immediately” lift its restrictions, following the diplomatic progress made between the two nations this week. Both Sinn Féin and the Worker’s Party have condemned the move, with Mary Lou McDonald branding it as “outrageous”. McDonald said an explanation was due, and urged the bank to reopen the account. “The decision by Bank of Ireland to close the account is outrageous. The Ireland Palestine Solidarity Campaign are an established advocacy group that have spent years protesting against the treatment of the Palestinian people. To close their account citing that they associate with a ‘high risk country’. This is not only outrageous; this is insulting to the Palestinian people. Email “Anger as bank account belonging to pro-Palestinian activists is shut down”. Feedback on “Anger as bank account belonging to pro-Palestinian activists is shut down”.